I had recently an interesting discussion with a very experienced project manager that is involved in my current project. He is a typical "old date" project manager with titles like PMP and so on, but this is his first agile project. Our project will be finished within few weeks so we have started to collect information based on "lessons learned" principle. 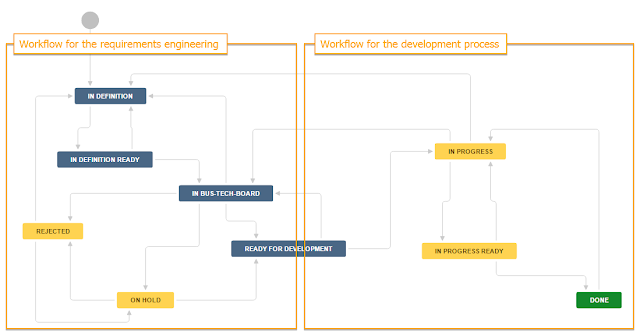 As I'm involved in this project in many different roles that start from architect (responsible for architecture), project manager (responsible for planning and scheduling) to the lead developer and tester (thus almost in the first line trench) at the end, I had an extraordinary possibility to look at my project from very different views. I have tried to explain him the differences between the role of project manager as he had in a classic (e.g. waterfall driven) projects and the role of project manager in an agile project. My main concern was regarding to the problem of non-existing detailed description of a role I've got in project, resulting in wrong positioning of myself in the organizational structure and some conflicting areas with the project management. There are many differences between classical and agile project management but one of the main is in the way the work is distributed and assigned to the team members. In a classic project, a project manager defines, dispatches, and monitors the job of the developers. As many studies have shown (and my experience too) that the maximum productivity of this supervised way of working is about 60-70%. Agile projects in contrasts, with their self-organizing teams can achieve up to 95% of the productivity (at the moment, please don't ask how to measure that ;) which is a tremendous result in case of every IT project. But let's go back to my colleague. His question was actually, what a project manager shall do in case of an agile project. If the agile team is responsible for all the stuff normally done by the project manager, like estimating, scheduling etc. what shall he do? I have found he had the problem with this sudden conclusion; an agile project doesn't need any classic project management. No Pert and Gantt. Ok, not so quickly. But anyway, especially one of his (humorous) sentences has made me cold: "Let's remove this anxious democracy from the process (self-organizing, feedback etc.). Then we will get a normal project, won't we?" ;). In my opinion there is still lack of understanding and acceptance for need of project leader role (which actually I have in my project), especially within project management community; even if in the manufacturing industry such role exists since many, many years already (with different names like system developer, chief engineer, solution architect etc.…). 4. Creates and maintains FBS (feature brake down structure), estimates and schedules. As you can see this list contains some points that in the classic project management belong to the project managers. Cool recapitulation of differences between project leaders and project managers provides LSD: project managers arecoped with complexity (plan and budget, organize and staff, track and control) but project leaders are coped with change (set direction, align people, enable motivation). But as I have stated already what is really important is the positioning of the project leader within his organization and customer projects. It very critical that the project leaders have the same position and should benefit from the same esteem as project managers do. Project leaders should have an access to all information project managers get and be involved in all communication loops defined for the management within project. Only then a project leader can act effectively. So back again to the question what is the role of a project manager in an agile project? Do we need them? Yes, we do. The key task of a project manager in an agile project in my opinion is to eliminate waste from everything around and outside of the project core, means design-development-test-delivery area. Waste means anything or process that does not add value to a product. The key task of the project leader in contrary is to remove waste from everything inside project core. Only if project manager and project leader are playing together, an agile project can be closed successfully.